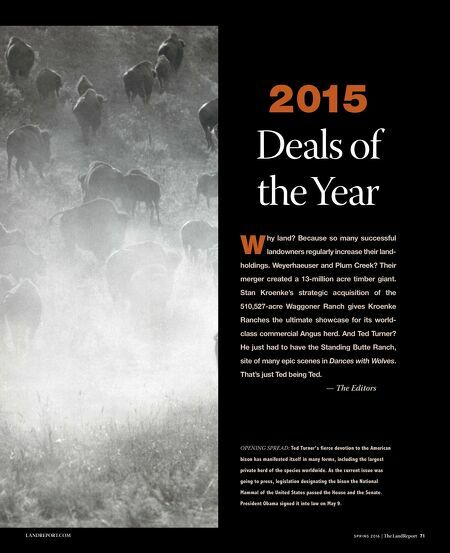 2015 Deals of theYear S P R I N G 2 0 1 6 | The LandReport 71 LANDREPORT.COM W hy land? Because so many successful landowners regularly increase their land- holdings. Weyerhaeuser and Plum Creek? Their merger created a 13-million acre timber giant. Stan Kroenke's strategic acquisition of the 510,527-acre Waggoner Ranch gives Kroenke Ranches the ultimate showcase for its world- class commercial Angus herd. And Ted Turner? He just had to have the Standing Butte Ranch, site of many epic scenes in Dances with Wolves. That's just Ted being Ted. 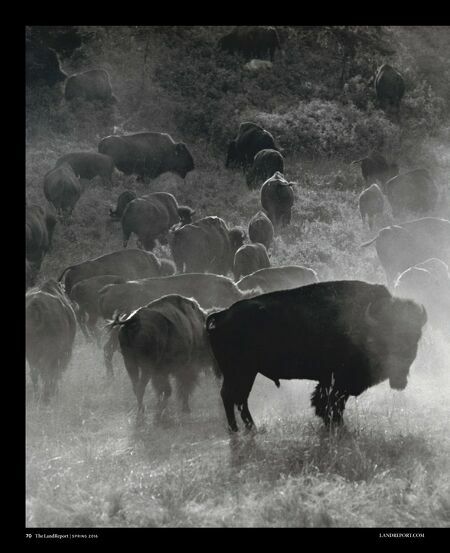 — The Editors OPENING SPREAD: Ted Turner's fierce devotion to the American bison has manifested itself in many forms, including the largest private herd of the species worldwide. As the current issue was going to press, legislation designating the bison the National Mammal of the United States passed the House and the Senate. President Obama signed it into law on May 9.